It could almost be a pub quiz question, which is the oldest novel in the world? The prize for the first English language novel usually goes to Robinson Crusoe from 1719 although there is an argument as to earlier stories in verse such as The Canterbury Tales written in the 14th century but it somewhat depends on the definition of what actually constitutes a "novel". However, if the language requirement is removed there is one clear stand out, The Tale of Genji. Written in 11th century Japan, it follows the life and escapades of a courtier, a son of the Emperor, disowned as being illegitimate. The fascinating element of the story is, if the settings were updated, this could be an everyday story from modern times even though it was written over a thousand years ago. Genji grows up, falls in love, gets into trouble, faces the challenges of life and did I mentioned gets into trouble? Quite often. Translated three times into English, it would today be considered something of a bodice ripper. 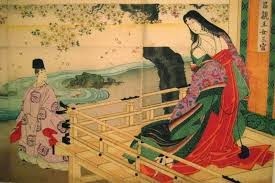 Written in sections over a number of years by the Lady in Waiting Murasaki Shikibu from the Japanese royal court, it was to entertain the other ladies. Although in general it doesn't use names but titles, there are something over four hundred characters who come and go (and very often die) and all age together as the story unfolds. And written in the court vernacular of the day, within a century it became unreadable by most for the next eight hundred years. But it is highly entertaining and he does get into a lot of trouble. Quite often.